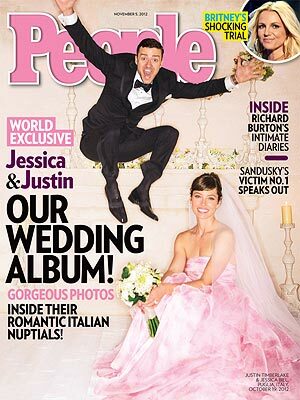 Justin Timberlake and Jessica Biel are officially my favourite newlyweds...look at this photo! So less douchey than I expected. Not that I think JT is a douche, I just thought Jess was a little bit more serious. I can't always be right. I am however, choosing to believe that the awesomeness of this photo is highlighted by JT's face and jump. I also like that her dress is pink. Not that I like pink...but it's different. Air high fives all around on this photo.